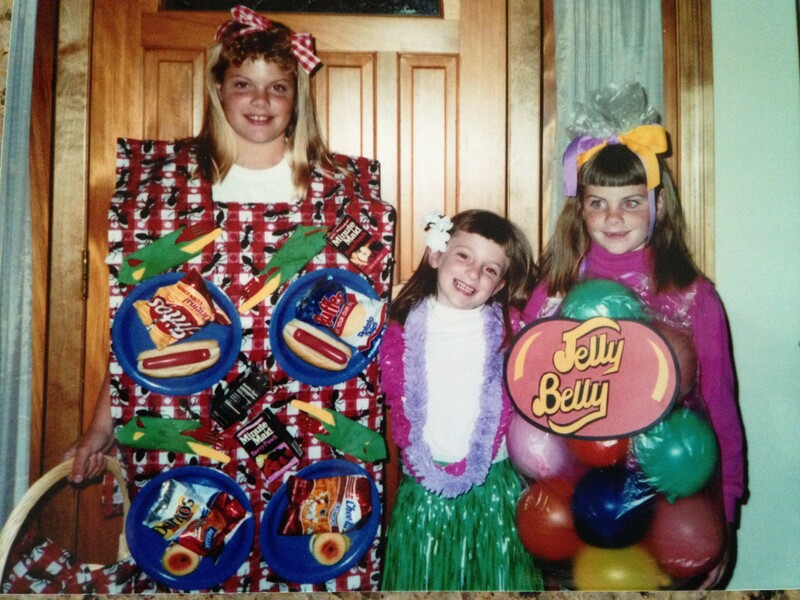 Erin the Picnic, Kelley the Hula Girl, and Sarah the Bag of Jelly Belly’s. Ah, Halloween. It was the one night when bedtimes didn’t matter (within reason), and a sugar rush was acceptable—almost expected. And for one night you could experience being somebody other than yourself. Then comes the year when you stop trick-or-treating altogether (I was probably in junior high). I felt so grown up—trick-or-treating was so juvenile! But being on candy patrol wasn’t as much fun, as it turned out. Today, HALLOWEEN, PERIOD, even if I dressed up, just isn’t the same. There are just too many creeps who are ready to “pounce” on unsuspecting children partaking in an innocent pre-November tradition. You see on the news the stupid people hiding razors and things in candy or lacing it with drugs. I know I sound like an old geezer, but I miss the innocent days. My sisters and I got costume ideas from American Girl magazine, Dad was the designated pumpkin carver, and a fun-size Reese’s Cup made my night. I’m now 32 and my sisters in their late 20s. I’m positive they would wholeheartedly agree when I say I wish I appreciated those days of trick-or-treating, when my only problem was which candy bar to eat first.